The Northern Cardinal is a year round resident in much of the eastern and middle United States and Canada as well as down through eastern Mexico, Belize, and Guatemala. 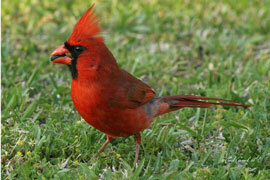 In New Hanover and surrounding counties, it is the only bird that has red plumage head to tail. Both males and females of this species sing, although usually males are more noisy than females. These birds sing year round. Adult male Northern Cardinals have the familiar red plumage that most people identify with the species, an orange beak, and the black mask and 'beard' around the face. Adult females also have orange beaks but their plumage is a light tan often with a red tinge toward the end of their tails, wings, and the crest of feathers on their heads. Immature cardinals will look very similar to females, although their beaks will be a grayish/brownish/yellowish color instead of the bright red of the adults. Although found throughout most of the eastern US, cardinals tend to nest in shrubby areas such as vine tangles, dense forest edges, or even some of the plants in your backyard! 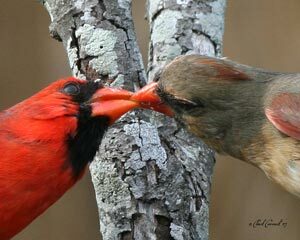 In the wild, cardinals eat a variety of seeds. To attract them to your backyard, their favorite commercially available seeds are sunflower and safflower. At Wild Bird & Garden, we offer these seeds sold separately, as part of pre mixed blends, or simply mixed together themselves in a mix called 'cardinal's favorite'. 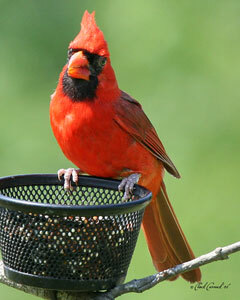 Cardinals are also preferable to certain types of feeder perches. They often prefer the 'hopper' style feeders, but also like feeders with perches that are a little bigger. We sell a variety of these at Wild Bird & Garden, and our store associates will be able to help you choose the right feeder for this purpose. Feeding cardinals year round is sure to bring color and cheer to your backyard no matter what season.